February 8 – Every Short Story is a Ghost Story: Tracing the Presence of Katherine Mansfield with Tracey Slaughter (a great speaker), 6pm, Waikato Museum, free. February 14 – The Garden Party Talk & Concert with Penelope Jackson (another good speaker) and cellist Martin Griffiths, 5.30pm, Waikato Museum, $5. February 23-24 – The Case of Katherine Mansfield, 7.30pm, Mansfield Garden, Hamilton Gardens, $25. February 28 – Katherine Mansfield with Dr Maebh Long, 1pm, Waikato Museum, free. March 2 – Mansfield Garden Party, 10am-3pm, Mansfield Garden, Hamilton Gardens, gold coin. Until March 3 – The Garden Party Exhibition, 10am-5pm daily, Waikato Museum, free. I was given a sneak peek of the Mansfield Garden in 2017, but largely sworn to secrecy, so must get over and revel in the finished garden – Hamilton Gardens has never had so many sponsors for a project – and enjoy some of these associated events. And after all the weather was ideal. They could not have had a more perfect day for a garden-party if they had ordered it. Windless, warm, the sky without a cloud. Only the blue was veiled with a haze of golden light, as it is sometimes in early summer. The gardener had been up since dawn, mowing the lawns and sweeping them, until the grass and the dark flat rosettes where the daisy plants had been seemed to shine. As for the roses, you could not help feeling they understood that roses are the only flowers that impress people at garden-parties; the only flowers that everybody is certain of knowing. Hundreds, yes, literally hundreds, had come out in a single night; the green bushes bowed down as though they had been visited by archangels. KM was born Kathleen Beauchamp in Wellington in 1888 and died in France in 1923. Read a biography here. 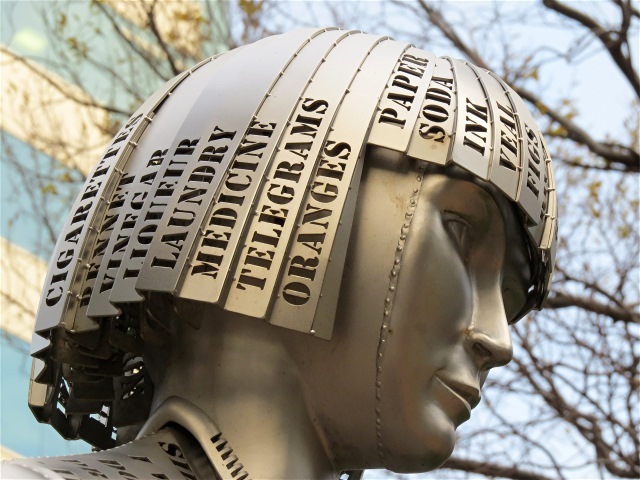 Thrilled to make the acquaintance of the Woman of Words artwork in Wellington last month – a tribute to Katherine Mansfield, New Zealand’s greatest writer, by sculptor Virginia King that was unveiled in 2013. 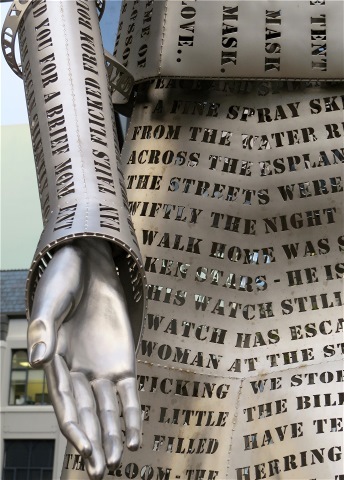 Read King’s story about the work here, including the detail of references within the work. Not long before our trip to Wellington, I bought a copy of Katherine Mansfield’s New Zealand by poet and Mansfield scholar Vincent O’Sullivan, a collection of photos of KM or from her era with commentary and KM quotes that brings to life her time and milieu in this country. Mansfield was born in Wellington in 1888, leaving for good to live in London in 1908 and dying in Fontainebleau, France in 1923. She is known for her short stories (she also wrote poetry but it hasn’t stood the test of time) and one novella, The Aloe, a longer version of Prelude, that was edited and published after her death by her husband John Middleton Murry. In Wellington we walked part of the way to the Pencarrow lighthouse (didn’t have enough time to do the whole track) and on the way out and back stopped in Day’s Bay for nourishment. For me, Day’s Bay is essential KM territory so imagine my delight when I spied a sign that said ‘Katherine Mansfield House’. Haiku husband found a park and we walked back to it, and lucked upon a chatty workman. 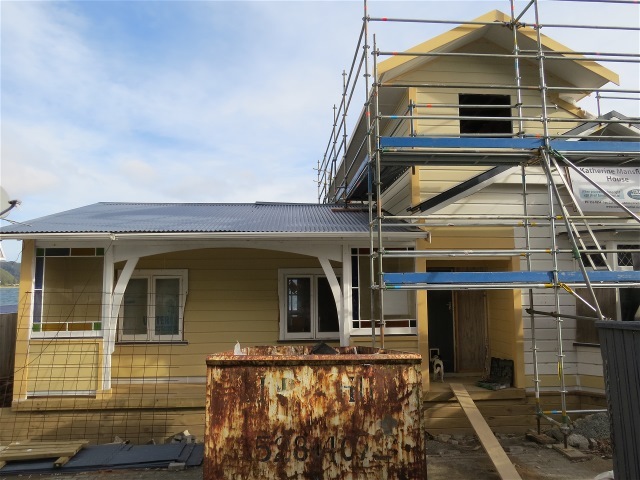 It was being renovated after a storm, he said. Read a 2013 news report about that here. Nothing original left, he said. And how right he was. The O’Sullivan book contains a photo of the cottage which was built in 1906 for the Beauchamps (KM was born Kathleen Beauchamp), a tiny, single-storey dwelling, although the family had been going to Day’s Bay for summer holidays since the 1890s. Today, the sea is still at the back door and the only road in and out of Day’s Bay around the coast to Wellington is virtually at the front door. As the morning lengthened whole parties appeared over the sand-hills and came down to the beach to bathe. It was understood that at eleven o’clock the women and children of the summer colony had the sea to themselves. First the women undressed, pulled on their bathing dresses and covered their heads in hideous caps like sponge-bags; then the children were unbuttoned. The beach was strewn with little heaps of clothes and shoes; the big summer hats, with stones on them to keep them from blowing away, looked like immense shells. It was strange that even the sea seemed to sound differently when all those leaping, laughing figures ran into the waves. Read the whole story here, courtesy of the Katherine Mansfield Society.